On 12 December 2015, Aleksandr Ryklin, chief editor of Ezhednevnyi zhurnal and a Solidarity movement activist, was detained by police, along with at least 33 other people, at a rally to mark Constitution Day. 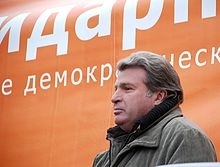 The rally had not received permission from the Moscow city authorities. Other prominent detainees included head of the Yabloko party Sergei Mitrokhin, director of the NGO For Human Rights Lev Ponomarev, and head of the INDEM Foundation, Georgy Satarov. Ryklin was subsequently released by police, but on 14 December he was detained again by police while driving. The Moscow Times (quoting Interfax) reported Ryklin as saying: “I think there was some mistake on December 12th. Apparently, they decided that they released me by mistake and then detained again.” In a court hearing on 15 December he was fined 1,000 roubles for failing to obey police at the rally on 12 December [Georgy Satarov has described the court hearing in an article in ej.ru, an extract from which has been translated by Rights in Russia].